I decided to make cards for the current Flourishes challenge to make two cards, similar or the same layout, one for her, one for him. 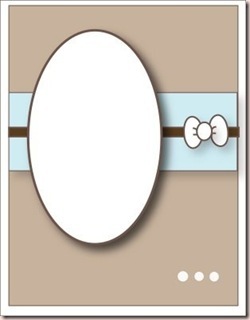 For the ‘hers’ card, I used CTMH cardstock because of the white core. I should have used it as a layer, not as a card base because it is too thin IMHO. Sorry Janet! (my girlfriend who sells CTMH!) The white core was great for dry embossing and sanding though! I struggled on both cards trying to decide what to use as a focal image. Everything I wanted to use was horizontal not vertical and I had already added other elements preventing me from turning the card. At least, it didn’t look right to me the other way. So I ended up using a sticker by Melissa Frances and put baby powder on the back to prevent it from sticking to the card where there are no foam dots. Super technique! For the ‘his’ card I tried hard to find CS that would match. None of my basic SU! colours matched and that is pretty much all the CS I have. So I tried colours I don’t use much and found that the retired River Rock worked perfectly! Now that I think about it, Kraft might have worked nicely too! Why do I always think of this stuff later? UGHHH!! I had no buttons that matched in my button jar but Basic Grey Bittersweet buttons were perfect! Again, all the images I wanted to use were horizontal, same as the ‘hers’ card. Included in the Lil’ Man paper pack were some stickers. This card is actually for my hubby and I wanted the sentiment to say ‘Thank You’ but none of the stickers were anything close, I assume because it is meant to be a scrapping kit. Cosmo needs to do something similar to Basic Grey and come up with small versions for card makers. Oh well, ‘Hi’ works and I’ll just write ‘thank you’ inside. I also baby powdered the back of this sticker. I would have stamped thank you instead of using the sticker but I don’t have any ink that matches either!! This is the trouble with using mainly one brand of cardstock and stamps; everything matches perfectly until you insert the monkey wrench of another brand of paper!! Now remember, this is a Flourishes challenge, that’s right- A STAMP COMPANY! URGHHHH. How could I have done that!! I rarely make cards without stamping and NEVER TWO IN A ROW!! I double checked the ‘rules’ and it doesn’t officially require stamping. It does say you can use Flourish stamps but it isn’t required. I’m sure that means you can use other stamps, not NONE, but it doesn’t say ‘stamping required’!! I hope that if by some freak of nature I am chosen, they don’t notice that I didn’t use stamping and choose another random number. I don’t expect them to read this far down!! This layout’s origin is unknown because I saved it to my iPhone’s photo album and obviously the designer did not include a website or keyword. Let me know if you recognize it so I can give credit where credit is due. 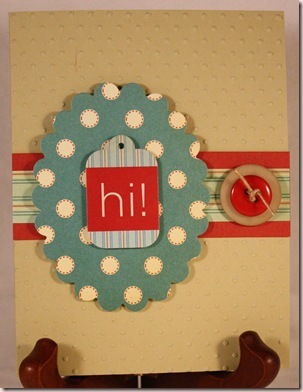 Did you also notice I forgot the three dots at the bottom and placed my oval and stripe at the midpoint of the card? I noticed my cards seemed a bit empty this way but did I check the layout? NO and now I wish I had imitated the layout more carefully. This challenge was nothing but trouble. If I get time, I am going to do it again properly! 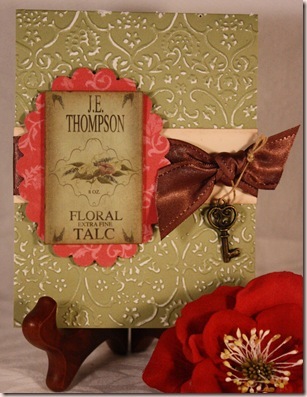 With a new layout and I am going to START with stamping!! These are beautiful, Rebecca–I especially love the top one! Ellen and I have both pled the case to Cosmo Cricket to produce small patterns for cardmakers, but they said that it just isn’t cost-effective. Their clientele is primarily scrapbookers, and printing small runs isn’t good for the bottom line, I’m guessing. So. . . that’s the skinny! Oh wow! I LOVE how you did the CB on the first one. How did you do that?! Fantastic! !